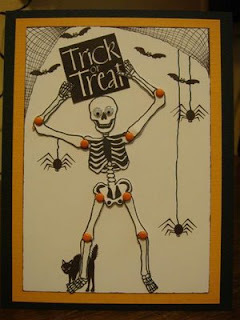 This is such a great skeleton stamp from Hot Potatoes (http://www.hotpotatoes.com/). It's called Skeleton Pieces N580. After you stamp the image, you need to cut out each section and then put him back together again. I actually stamped the image and then enlarged it on my xerox to make him larger. Very cool image!! 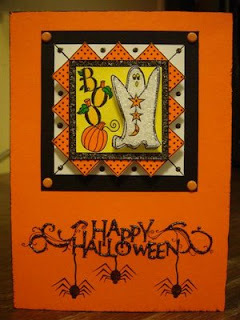 This main image is from Outlines Rubber Stamps. 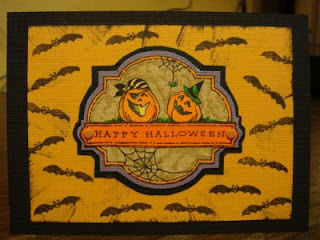 This image is from Stampendous (http://www.stampendous.com/) and it's called Pumpkin Plaque, V142. Would be cool to stamp on sticker paper too and adhere to a jar of candy. OK folks - 1 week to go until we elect a new President. For all the elections I have voted in, I cannot remember a more important election than this one!! 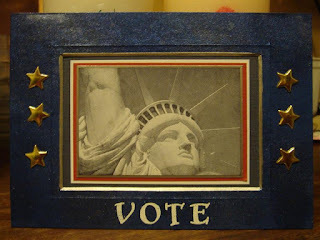 With that said, and, no matter which candidate you favor, please, just VOTE!! Too many people take for granted what their vote means. In the spirit of our election, I have stamped a few things. 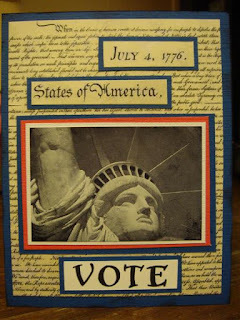 The image used is the Statue of Liberty from The Stampsmith (http://www.stampsmith.net/). It is a beautiful rubber stamp made from a photograph. Estelle, the owner of the Stampsmith, recently explained to me that the photo was taken by a dear friend of hers from Holland who she had met on kibbutz 25 years ago. One year her friend came to the USA and took this photo of the statue and it was made into this beautiful rubber stamp. Knowing the history behind an image just makes it more special. This card started out as a congratulations card for someone that just took his Citizen oath - another new citizen of the USA. The above card was done for a sketch on http://stampersquest.com/. Check them out to see other cards made with the same sketch. This started out as a white photo frame from Michael's. 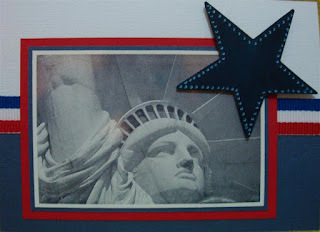 I added Glimmer Mist in reds and blues, the added the stars, and matted the stamped image as a photo.